Our Frisco location is at 3580 Preston Road Suite 101, Frisco, TX75035. 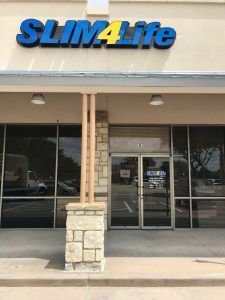 The Slim4Life Frisco location is in the Frisco Gate Shopping Center and opened in 2009, now located on Presto n Road next to Mattress Firm. The Area Supervisor for Frisco has worked for Slim41ife for 14 years, she transferred from our Kansas City Slim4Life. Her staffs goal is to provide excellent service for excellent results; excellence is their motto. If you want excellent service, quick weight loss results and live in the Frisco area, call and start living the slim life. Make an appointment at our Frisco weight loss center today!